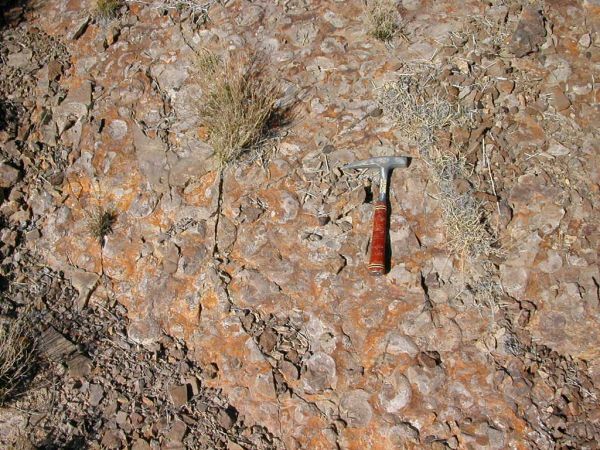 A 5.25 square meter area on top of the Anasibirites Bed in the Triassic Thaynes Formation of West Central Utah was uncovered, photographed, and mapped. Just the cephalopods that were fully exposed, and complete enough for orientation determination were mapped. 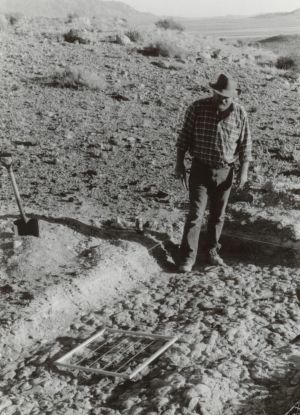 The area was excavated and photographed in October, 1997. It was collected by me in September, 1998, and by others, both known, and unknown, since. A small outcrop about 200m north of the mapped area provided samples for the cross section, the two units are easily correlated with the 20-50mm shale bed below the top section. The graphs on the stats page, come from the map, and show mostly information pertaining to the composition of the fauna and prefered orientation of the shells. The cross section gives information on the faunal composition and thickness of the strata. Studies that have been done trying to answer all the questions. No end in sight? Brayard, A., Bylund, K. G., Jenks, J., Stephen, D. A., Olivier, N., Escarguel, G., Fara, E. & Vennin, E., 2013. Smithian ammonoid faunas from Utah: implications for Early Triassic biostratigraphy, correlations and basinal paleogeography. Swiss Journal of Paleontology 132:141-219.